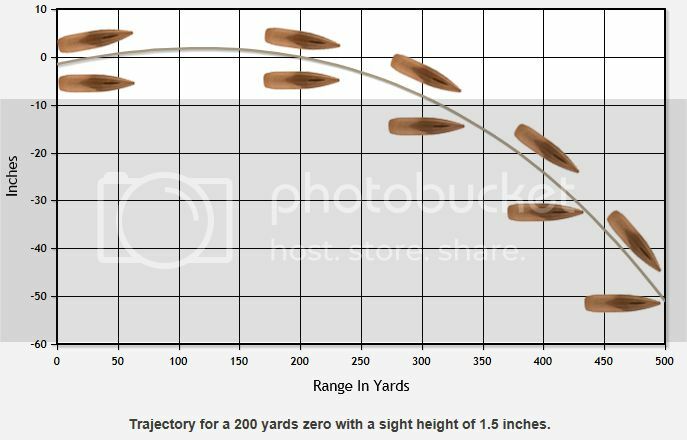 does bullet orientation during flight stay parallel to ground as the series of bullet images below trajectory line OR parallel to trajectory line as the series of bullet images above trajectory line ? Not that it matters,just curious. I'm gonna ask this on some other forums too. I don't know the answer but i've been told a bullet rises when it leaves the barrel. I do not believe this as it defies the law of gravity. Well If zeroed at 500yrds your bullet would climb then drop to the x or black. Look # 10 or newer reload manual there are ballisitic charts for bullet drop and zereo. Your muzzle on a revolver or pistol raises on recoil If the gun is in a vise these would to some dergee could be a trick ? because if a peice of paper was in front of the barrel what would be drop then? Thats what i mean, Dan. I'm talking, the gun not zeroed for any distance, just vised perpendicular to the ground. Forget the sights and sighting all together. Does the bullet rise as it exits the barrel, or travel perpendicular to the ground before it starts to loose velocity and drop? there have been tests. the bullet never travels perpendicular to the ground when exiting a perpendicular barrel,it starts to drop immediately due to gravity. if a bullet,at the muzzle,is allowed to drop straight down at the same time the fired bullet exit the muzzle,they both hit the ground at the same time. I witnessed a 'test' back in the 80s'90s' for natural bullet drop. a bolt action was bore-sighted to a 100yd target then targets were set up at 75,50,25,10yds. targets showed a continual drop although the closer targets had debateable amounts of drop. Okay. I think I'm reading this wrong. The question in the OP is not trajectory, but the bullet orientation as it goes through this trajectory. We all know that a bullet fired from a gun will rise to the zero point then drop. The bullet climbs as a result of the barrel being pointed upward in relation to the line of sight for the iron sights or the scope. Given. What the Original Poster wants to know is does the bullet itself yaw or hem or haw. The answer is that if it's properly stabilized then it should NOT yaw, or go tail down, up or any other orientation. How do you know? What does the hole look like in your target? It should be perfectly round if the bullet is stabilized correctly. A bullet that yaws or looses it's spin stabilization will not be accurate and will key hole the target. A bullet at the end of it's useful trajectory can and sometimes do tumble, but typically, they fly parallel to the ground because of their spin stabilization.